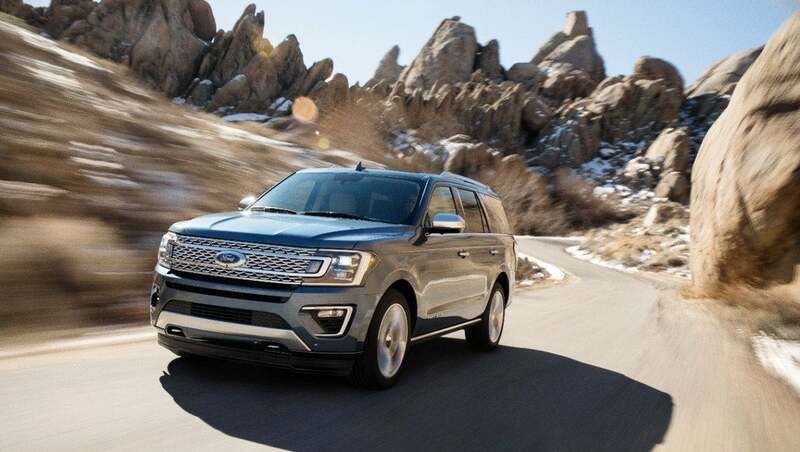 If you need something more rugged than a typical three-row crossover, the 2018 Ford Expedition is a must-look for families. 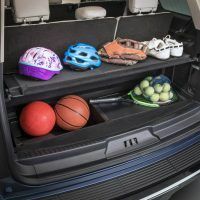 Needing to haul the kids, their friends, and maybe a few “toys” for that weekend trip away from civilization? It seats up to eight passengers, has a powerful, newly-redesigned turbocharged V6, and can tow more than 9,000 lbs. And in its Platinum trim, you will travel in style to business meetings, golf outings, and those evenings out at the dinner theater. 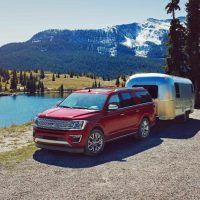 This week, we’ve been getting a taste of the top-of-the-line, 2018 Ford Expedition Platinum. 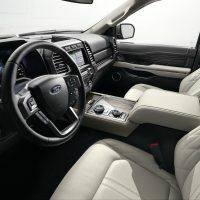 The 2018 Ford Expedition Platinum 4×4 ($73,030) comes with 20-inch wheels, front parking sensors, roof rack rails, retractable running boards, heated second-row seats, a leather-wrapped steering wheel, and a premium Bang & Olufsen 12-speaker audio system with HD radio. 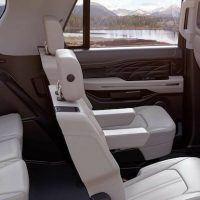 It also comes with second-row leather captain’s chairs (reduces seating capacity to seven) and a rear-seat entertainment system with dual headrest-mounted displays. This tester also came with the heavy-duty tow package, the self-parking system, and auto LED headlights and fog lights. Ford did not list exact pricing on the options as this was a pre-production model. Behind the wheel, the driver has a commanding view of the road because of the ride height and seating position. We were able to find the prefect driving position with the power/tilt telescoping steering wheel and adjustable pedals with memory. The seats are plush and there’s plenty of head, shoulder, and hip room for taller passengers. 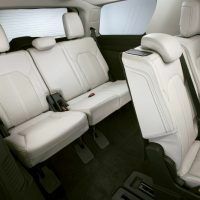 Families will find acres of room inside for spreading out on longer trips. 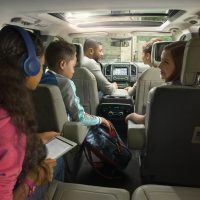 Kids won’t be asking, “are we there yet?” with the rear-seat entertainment system. The optional second row captain’s chairs are comfy, and there’s lots of legroom with the chair’s ability to slide forward and back. 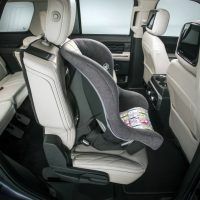 Even the third row, which is usually only good for kids in most SUVs, is decent enough to seat two adults for long distances. 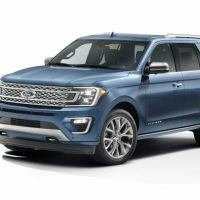 Expedition offers exceptional space for families needing to carry extra cargo. There’s 104.6 cubic feet behind the first row, 63.6 cubic feet behind the second row, and 20.9 cubic feet behind the third row. 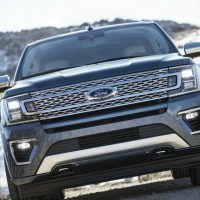 The Platinum Expedition is powered by a 3.5-liter EcoBoost V6. The engine’s 400 horsepower and massive 480 lb-ft. of torque marks an increase in power. It comes mated to a new 10-speed automatic with a tow/haul mode sending power to all four wheels. 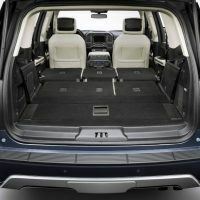 An FX4 off-road trim is available which includes additional skid plates and Ford’s Terrain Management System. Fuel economy estimates for our Platinum tester came in at 17/22 city/highway and 19 combined mpg using regular unleaded fuel. The Expedition gets a unique drive shifter knob that saves space. You just dial up “drive” and you’re ready to go. 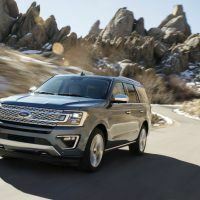 Once underway, the first thing we noticed was the Expedition’s more powerful turbocharged EcoBoost engine with its massive 480 lb-ft. of torque for the Platinum trim. One of the downsides: you need to run premium unleaded fuel to get those torque ratings. This big SUV has impressive acceleration and we had a hard time keeping our foot out of the gas. It’s one of the quickest SUVs in the class. We took the Expedition up I-70 at altitude west of Denver. Let’s just say, this family hauler feels like a much smaller vehicle. Passing slower traffic was not an issue; we had to watch our speed because it rises up easily. We did notice the considerable body lean in the tight mountain corners, so this big three-row is likely best when it’s on the open highway. 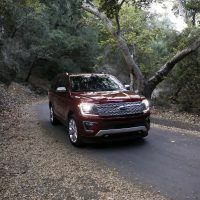 The new Expedition does come with an auto start/stop feature. That takes getting used to in city traffic. 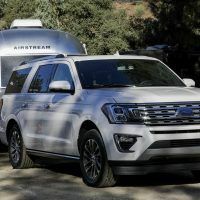 The Ford Expedition’s strong point is how it’s a truck-based SUV, meaning it can take some abuse. 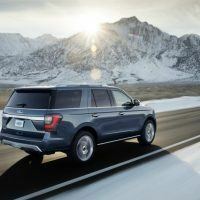 You can run the Expedition on muddy or dirt roads, or through snow and not have to worry about getting stuck. It can tow more than 9,000 lbs. when equipped with the Heavy-Duty Trailer Tow Package too. 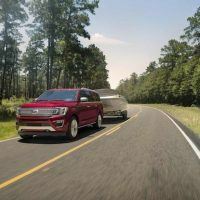 If you need a tough-as-nails, seven- or eight-passenger SUV, with towing capacity for a large trailer, and a lot of room for the kids and pets, the 2018 Ford Expedition is a great choice. For extra luxury, move up to the Platinum model. 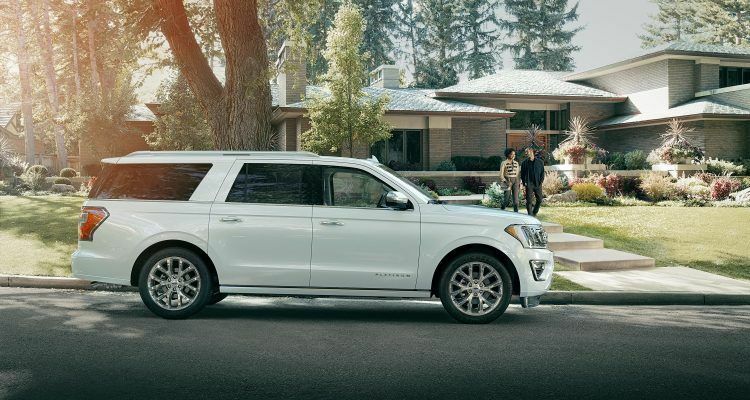 Overall, the 2018 Ford Expedition is ideal for families with active lifestyles who need more than a typical kid and grocery hauler. 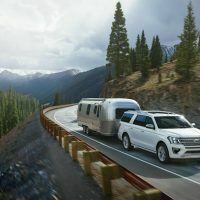 2018 Ford Expedition Official Site. 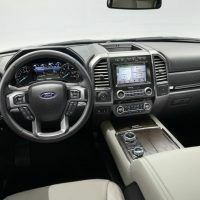 No Comments on "2018 Ford Expedition Platinum 4×4 Review"